After months of dribbling out incomplete document requests made by frustrated GOP lawmakers, President Trump may be about to override Deputy Attorney General Rod Rosenstein and use his presidential authority to declassify several caches of information related to the DOJ/FBI's ongoing Trump-Russia counterintelligence operation, according to former IBD Bureau Chief Paul Sperry. Sperry tweeted on Sunday that President Trump may declassify: 20 redacted pages of a June, 2017 FISA renewal, "and possibly" 63 pages of emails and notes between "Ohr & Steele," and FD-302 summaries of 12 interviews - In reference to twice-demoted DOJ official Bruce Ohr and/or his wife Nellie, both of whom were working with opposition research firm Fusion GPS to investigate Trump. As Cristina Laila of the Gateway Pundit notes, Rosenstein and then-Deputy FBI Director Andrew McCabe both signed off on a June 2017 FISA surveillance warrant renewal on former Trump aide Carter Page. Meanwhile, several frustrated GOP lawmakers have called for the full release of the requested documents - with Freedom Caucus Chairman Mark Meadows (R-NC) and Rep. Lee Zeldin (R-NY) calling for their declassification recently, and Meadows and other members drawing up articles of impeachment against Rosenstein, only to withdraw them shortly thereafter. 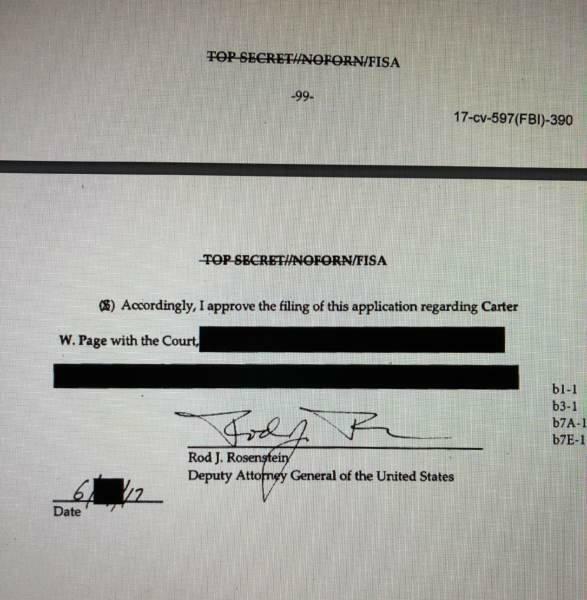 It has come to the point that @realDonaldTrump himself needs to & should declassify the Carter Page FISA warrant applications & ONLY redact sources & methods that must be redacted. There is NO good reason why the public has not yet seen this information. Potentially groundbreaking development here. The Carter Page FISA docs should be declassified and further unredacted (protecting only sources and methods) so Americans can know the truth. Let's see if the president will follow suit and declassify documents that could only help his case. Then again, the DOJ is likely to scream "sources and methods!" and claim that the lives of countless intelligence officials will be forever compromised.